Addo Dung Beetle Guest Farm - Addo Accommodation. "Miskruier" the name of our working Citrus farm is not only just a name the owner, Mr. HHJ Potgieter, decided upon years ago when he bought the property in 1996. He already had the idea so save this special flightless dung beetle. After developing the farm into a highly productive commercial citrus farm, exporting 14 varieties to approximately 60 countries world wide. Mr. Potgieter then decided to build five chalets with a lapa overlooking the Zuurberg Mountains and with this development he wanted to give something back to nature and so built a 50 x 50 m enclosure for the protection of these flightless dung beetles. Incidentally we also started off with 11 dung beetles on the 19th July 2006. 150 Cubic meters of soft sand was off loaded into the enclosure to provide the dung beetles with a suitable environment for their activities. The Conservation Project's purpose was to breed and re-introduce the dung beetles back into nature. We also wanted to create an awareness of Conservation outside a National Park. BUT, unfortunately we had difficulties in succeeding with breeding this little special beetle. We had to release all off them we had due to that we could not source enough fresh dung on a regular basis. We SUCCEEDED in creating awareness for the dung beetles as we wanted. We still do talks and have a lovely awareness page on our website. The owner have developed 100 ha of our 240ha Succulent Valley Bush Veld (one of the 7 biomes), into citrus land and have sold all the game. In the 140ha Succulent Valley Bush Veld, guest can still enjoy hikes as some of the natural wild life that naturally still accure in the area. Addo Dung Beetle Guest Farm is situated 4 km from the Main Gate of the Addo Elephant National Park on a working Citrus Farm. The Citrus part of the Farm is approximately 250ha with an estimated 151 000 individual trees. We have 5 luxury chalets B&B and then 3 Rustic Bush Cabins with Self-Catering facilities. We are ideal for couples, parent-breakaways, honeymooners and also for small group of 10 people sharing in the Luxury Chalets and 6 people sharing in the Rustic Bush Cabins. In our Thatched Roof Lapa we prepare traditional South African mouthwatering set meals on the fire while you enjoy a sundowner with us, booking is essential prior to arrival date. Luxury chalets 2 children extra, we add 2 x single stretcher beds with linen and towels or baby camping cot. 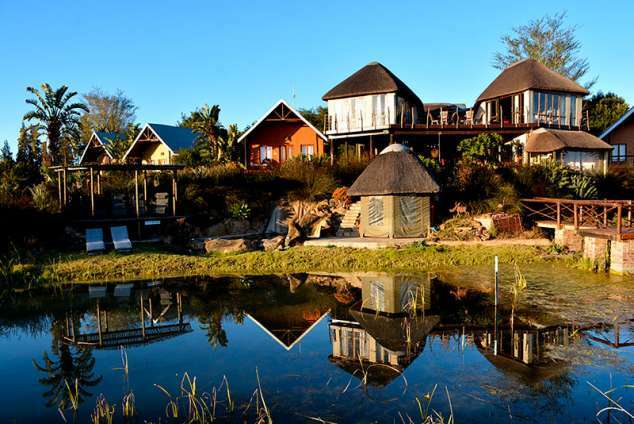 Our 5 Luxurious Chalets are nestled on a Mountain top over looking the magnificent Zuurberg Mountains. Each of our Chalets has a mountain view. We have Chalets with 2 twin beds or a queen size bed. The chalets are equipped with the following: TV (SABS 1, 2, 3 and e-TV), air-conditioners with a heating and fan option, mini bar fridge, hairdryer, microwave, coffee & tea, safe and hangers. Each Chalet has an en-suite bathroom with 2 hand basins, in-side shower, outside shower, bath, toilet and all the towels are supplied. All our bedside tables and headboards are made up from a combination of local wood species found in the area. (Yellow woods, Oaks, Sneeze woods, Black Wood) The Sneeze wood chandeliers found through the Chalets and Lapa were used as fence posts on the farm until a few years ago. They are termite prufe. The porcupine quill lamp shades found in the bathrooms and the lapa were hand made by the owner. 3 Self-catering facilities or with a B&B option. Our 3 private wooden rustic bush cabins are for those real nature lovers situated each on different levels on the hillside in our safari area. Walking distance from the main lodge and parking area. Each rustic bush cabin has its own private out-side flushable toilet and out-side open air shower adjacent to the cabins. You can enjoy your magnificent mountain view when you are preparing your food on your open deck kitchen or on the fire. Not really suitable for those with walking difficulties. Guests may make use of the other Addo Dung Beetle facilities at the main lodge area such as the swimming pool and more. 19782 page views since 28 Jul, 2006.